Welcome to the Justice Press, an imprint of the Legal Service Bulletin Cooperative. The Justice Press publishes books, monographs and edited collections on issues of social justice, human rights, legal education and law reform in Australia. Auty and Russell take us to another time in the capital of Melbourne. This is a story about displaced, isolated and abandoned Palawa. Two – Tunnerminnerwait and Maulboyheenner – were executed. 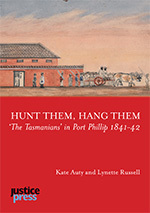 Three women – Truganini, Planobeena and Pyterruner – were returned to their country, grieving and brutalised. This essay is an examination of the conduct of an erratic and incompetent trial judge (Willis) who had failed in other jurisdictions and who was now 'in charge' of a fledgling colonial justice system, and of a Protector, G.A. Robinson, complicit in a great injustice. Across the narrative the reader is introduced to groups of Europeans, both official and unofficial, acting as hunting parties, their conduct approved both tacitly and, finally, officially. Readers will be shocked by the treatment of the Palawa in this tragedy – not Shakespearean times, but Victoria in the 1840s. Just two amongst the appalling issues examined here are the direction by the judge to proceed with capital changes, overruling a prosecution application reducing them, and the trial being forced on in the absence of significant witnesses. This essay is a challenge to the fairness of the legal process that led to the hanging of Tunnerminnerwait and Maulboyheenner on a horror day, watched by thousands in early Melbourne. It is a warts-and-all review of the state of civil society in early Victoria as it related to a race without a voice. 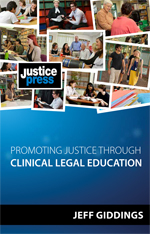 Queensland Chief Justice Tim Carmody recently paid tribute to Jeff Giddings’ book Promoting Justice through Clinical Legal Education, published by Justice Press. Here’s the Chief Justice’s address, delivered at the Queensland Law Society’s annual Personal Injuries Conference on 17 October 2014. Address courtesy of Supreme Court Library Queensland, with permission from The Hon Tim Carmody Chief Justice of Queensland. Clinical legal education is of increasing significance to law schools in Australia and across the globe. The potential to combine community service with student learning distinguishes clinical teaching from other forms of legal education. This book considers how to best recognise and realise the contributions that experiential learning methodologies can make to legal education. It identifies the contributions that clinical programs can make to student learning, social justice, community engagement and research. In this book, Jeff Giddings provides a framework for understanding both the pedagogical and political dimensions of the establishment and sustainability of clinical programs. He uses in-depth historical case studies of major Australian clinical programs to identify how various interested groups can harness the great potential of clinical legal education. Professor Jeff Giddings is Director of Professionalism at Griffith Law School. He was the Founding Director of the Griffith Clinical Legal Education Program and has written widely about the history and practice of clinical legal education. Copyright © 2019 Justice Press. All Rights Reserved. Developed by snaffle.